Posted by Christopher Donohue in History of Economic Thought, Uncategorized. Edward Alsworth Ross (December 12, 1866–July 22, 1951) was a professor at Stanford and University of Wisconsin, founder of the sociology of “social control,” and a forefather of the sociology of deviance and criminality systematized by Robert K. Merton. 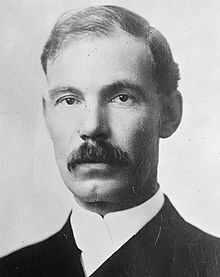 Ross was also an important author of sociological introductions and textbooks, of which Robert E. Park and Ernest W. Burgess’ Introduction to the Science of Sociology (1921) and W. I. Thomas’ Source-book for Social Origins (1909) were two important examples. Although the function of the textbook in the standardization of social scientific knowledge and methodology is an important topic and has, in my opinion, not attracted significant scholarly attention, what I am most concerned with here is what I call the persistence of gemeinschaft in the American social sciences. What I mean by this is the construction of a dichotomous relationship between city and country. Ferdinand Tonnies in the nineteenth century believed peasants and the countryside to be dominated by tradition, kinship, and custom. The cities, on the other hand, were determined by the workings of capitalism and the market. It was in the cities, as Georg Simmel observed later, that individuals achieved an immense individual freedom, but consequently, remained strangers to one another. This was one of the latent ideas in my post on Robert Redfield and has since become a more important element of my research. The persistence of gemeinschaft also serves to shed a light on the relatively unknown historical presence of rural sociology. As importantly, the the persistence of gemeinschaft concept also dovetails nicely with discussions of “urban selection” among social theorists.